Dear Readers, after a week in Dorset with my parents (about which more next week) I was eager to get out into the cemetery to see what was going on (for the back story to this post, have a look here and here). My lovely friend A had taken over my jam sandwich duties while I was away, but had only seen the tail end of a fox disappearing into the brambles. 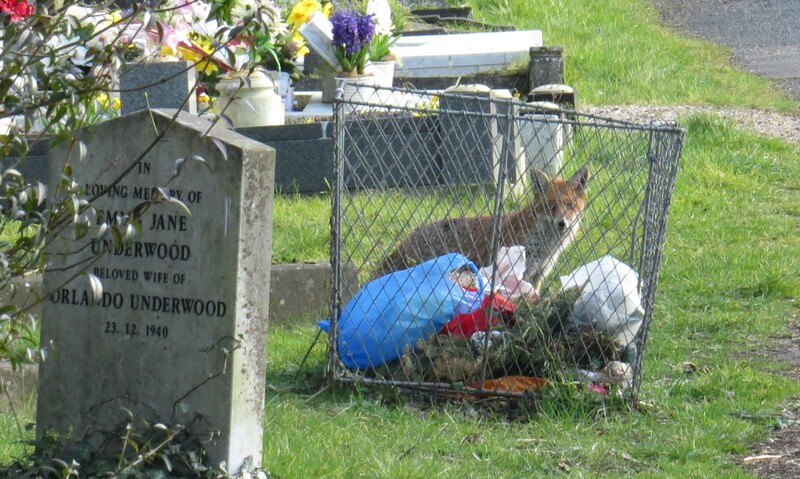 So, on Good Friday, I dropped off my jam sandwich at the usual spot and was heading off when I saw the fox above, who ran between the graves and attempted to hide himself behind this rubbish bin. I rather think that it might be ‘my’ mangy fox. Who knows. If it is ‘my’ fox, he looks a little better, but I couldn’t see the relevant side of the animal to judge how the mange was doing. We walked on a little further. What a beautiful evening it was, and, according to the weather forecast, the last decent day of the four-day bank holiday. The shadows are so long at this time of year, the birdsong so loud that I felt as if I was walking in a dream. And then, we turned a corner. 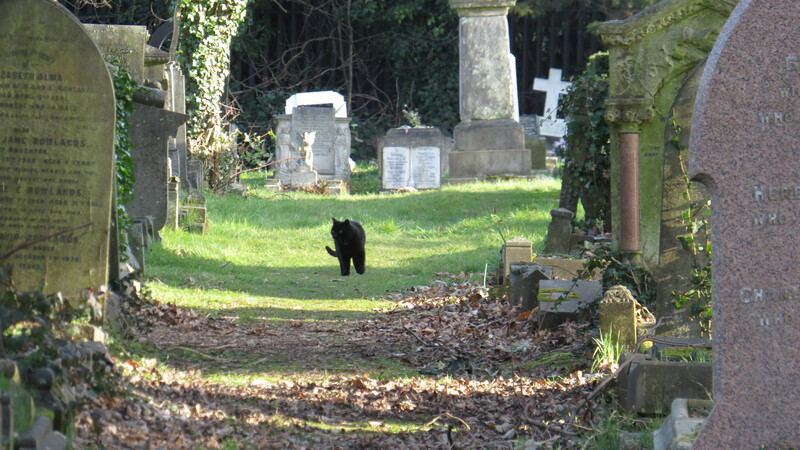 A miniature panther was patrolling the cemetery, and he was not alone. 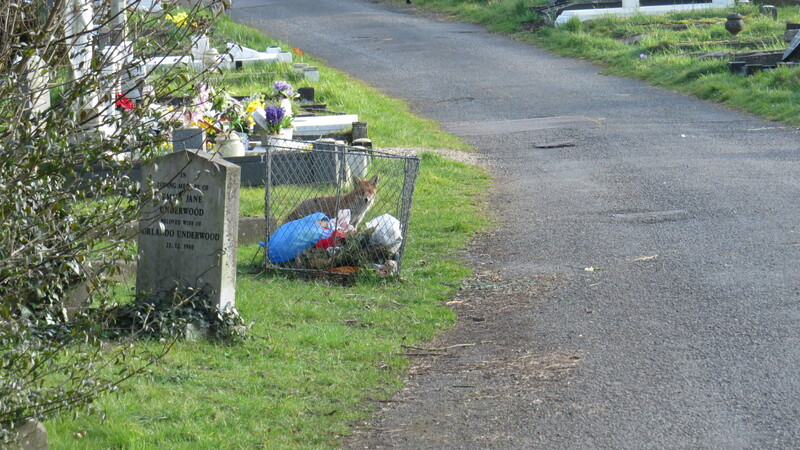 There is a small colony of feral cats who live in the cemetery, and who are cared for by a fine London lady. I shall call her B. She has long white hair and blue eyes the colour of forget-me-nots. 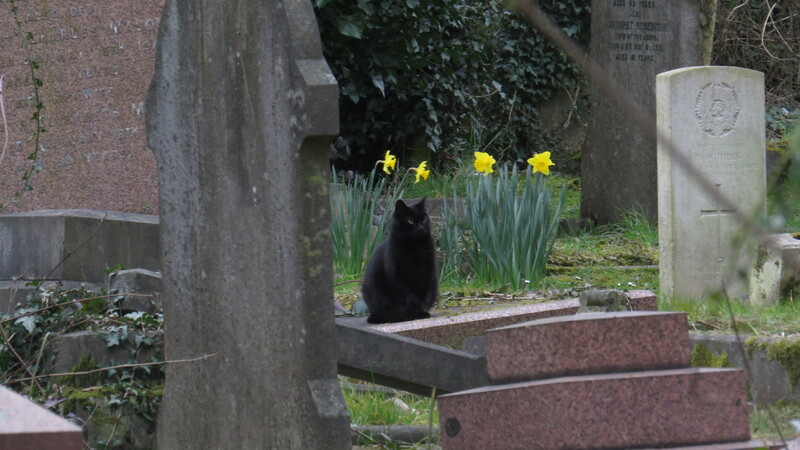 Every day, she visits her husband’s grave, and then comes on to leave food for the four identical (to me, at the moment) jet black moggies. She told me that one of them, Boris, is an unneutered tom that no one has managed to catch, and that he is always getting into fights. I shall be keeping my eyes open for Boris. Of course, the food doesn’t only attract the cats. Who is this sneaking away in the background? B knows my little mangy fox, and says that he often waits patiently until she moves away, and the cats have had their fill – they are more than a match for any fox who tries to push in. And so, now I have a new place where I can leave a jam sandwich, in the knowledge that it has some chance, at least, of reaching the intended diner. Which is just as well, because as we walked back past the place where I’d left the medicated food, I noticed someone enjoying it who was not the intended recipient. And as I watched, the last piece was carried off to be enjoyed in peace. It seems no one can resist a jam sandwich. 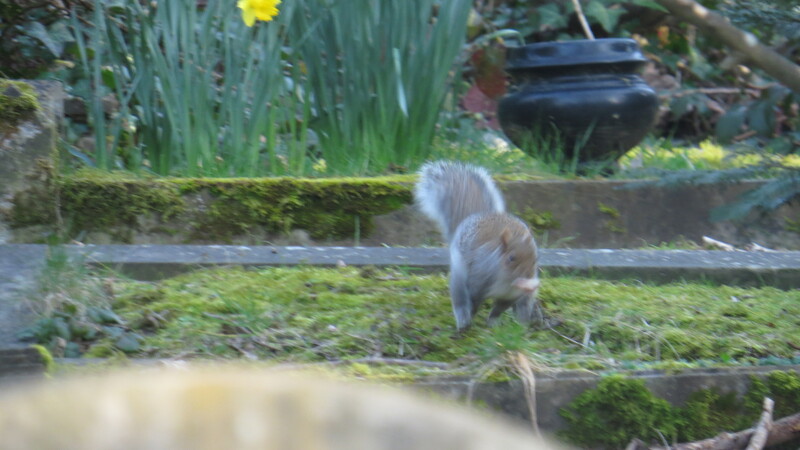 This entry was posted in London Mammals, London People, London Places on March 26, 2016 by Bug Woman. And a colony of cats too what a kind person B is too! 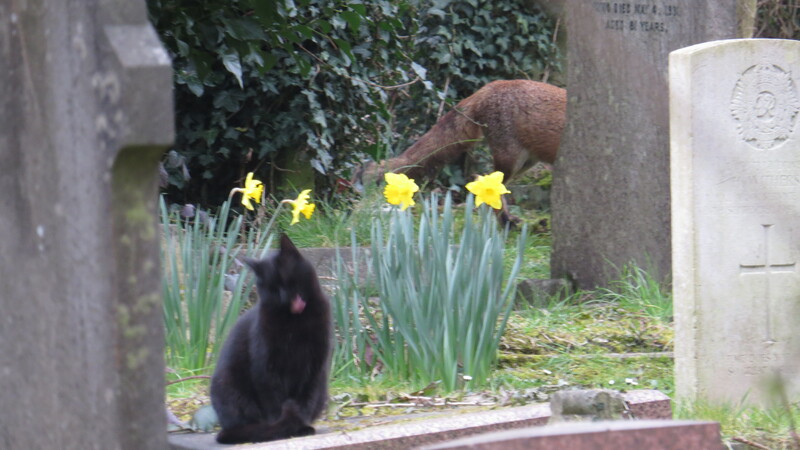 The last photo with the black cat and fox in the background does look like the mange fox but it’s fur looks a lot better if it is him…well done for persevering with his jammy treated treats, even if Mr Squirrel is nicking some…what a monkey! This is such a great thread, it’s a little real-life drama and I wait, read and hope for a happy ending. Me too, Gail, me too! Yesterday I found where the mangy fox has his den, so I can deposit my jam sandwiches with a bit more accuracy. Fingers crossed! What a wonderful person you are! It is so nice to know that people still care, it is not the fox families fault that they find their natural habitat turned into Towns and Cities. Far too many look upon our wildlife as ‘vermin’. Suffering is suffering and this poor fox (probably many like it) looks pretty fed up and poorly. So let us all hope that your Herbal Jam Sandwhiches help relieve the symptoms making a happier little life. Thank you, Shawdiane! And I agree totally. 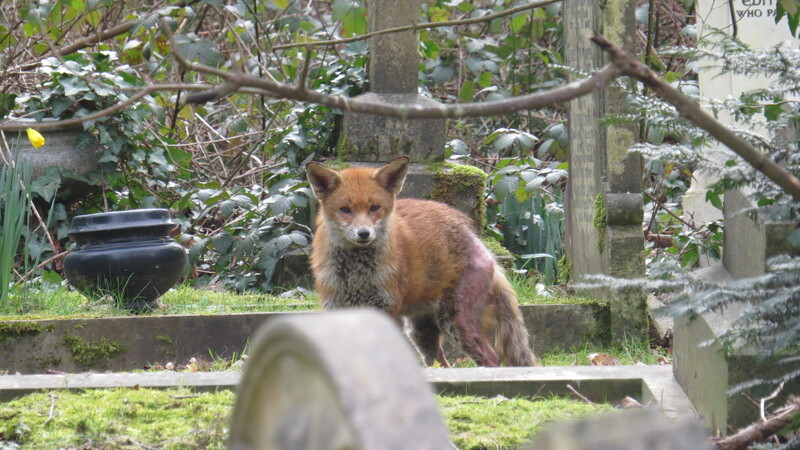 The cemetery where these foxes roam was once Finchley Common, a huge area of grassland where no doubt they had their earths and went about their business with only occasional encounters with humans. We’ve taken their homes, and then some people complain that they are noisy or destructive. But lots of people do care, and love to see them, so it’s not all bad. What a wonderful story, I am so pleased to have been directed to your blog by the gentle author. The jam sandwich story took me back a few years to when an old friend told me of when he was walking his young niece through Manchester’s Southern Cemetery he saw something moving ahead of them. 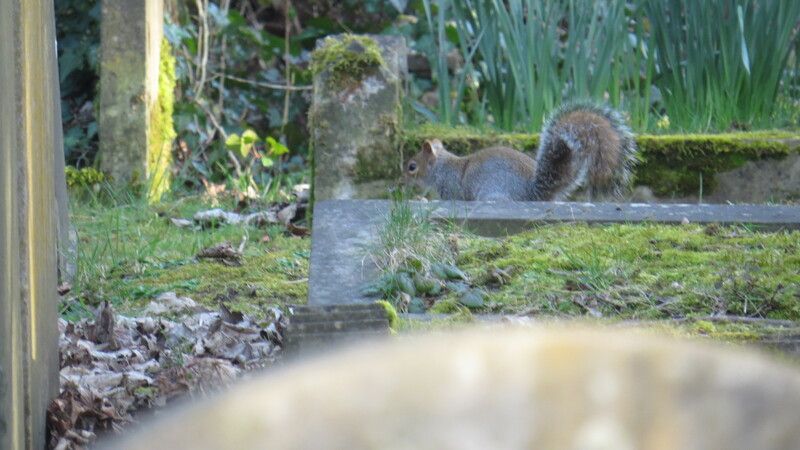 Being mildly myopic he asked “What’s that?” She replied “Its a squirrel and he’s eating a jam sandwich”. ” I don’t thinks so ” was his response to that unlikely starement and on reaching the now abandoned snack it proved to be – a jam sandwich. You have obviously hit upon the right diet for some of our wildlife chums and deserve high praise for your compassion.